WHAT: "A Journada," "Memorias," "Batuke." The "high-octane, high-flying" (The New York Times) energy of DanceBrazil takes center stage at The Joyce when the company returns for its 2011 season, with "A Jornada" (The Path), artistic director Jelon Vieira's landmark work that premiered at The Joyce in 2001. 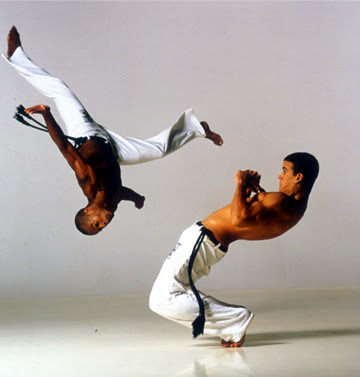 "A Jornada" follows the path of Africans to Brazil using the Afro-Brazilian traditional art form of Capoeira as the base, the link to, and an expression of the struggle and liberation of Afro-Brazilian culture. WHAT: "El Cid"- a Soviet-era story based on the 11th century Castilian military leader El Cid. The 2 act ballet is set to various Massenet scores, and Petrov plays the title role supported by an international cast including Gabriela Gonzalez as "Jimena." WHERE: Mason Hall, Baruch College 17 Lexington Ave. @ 22nd St.
WHAT: The company is known for presenting stars from other major companies on smaller stages at lower prices. The performance includes Sofiane Sylve (San Francisco Ballet) and Carla Körbes (Pacific Northwest Ballet) joined by local favorites Tyler Angle and Craig Salstein. "Mirrors" is set to live violin and piano and explores the self-conciousness of the dance studio, while "Dreamscapes" continues the Romantic ballet tradition. WHERE: Ailey Citigroup, 405 W. 55th St.
WHAT: "The Perfect Flower"- Lessons about the birds & the bees are implicit in the site specific piece that explores the biological utility of beauty as an attractor from the San Francisco company. WHERE: Central Park entrance @ W 106th St.